The president of Bolivia blamed the U.S. for the attack Sunday. Two top Trump administration officials have now denied U.S. involvement in the apparent assassination attempt of Venezuelan President Nicolas Maduro on Saturday night. "Ambassador Bolton said this morning there wasn’t an American connection," Pompeo told reporters on the flight as he prepared to return to Washington, D.C. "We don’t really have a lot of detail about what took place beyond what you’ve seen and what the -- I think the White House has put out so far." (AP) In this photo released by China's Xinhua News Agency, security personnel surround Venezuela's President Nicolas Maduro during an incident as he was giving a speech in Caracas, Venezuela, Saturday, Aug. 4, 2018. Bolton told Fox News' Chris Wallace on his Sunday morning show, "Well, I can say unequivocally there is no U.S. government involvement in this at all. Just within the past couple of hours, I have spoken with our charge in Caracas, the head diplomatic official down there. He and his staff were up much of the night making sure that Americans in Venezuela were safe." 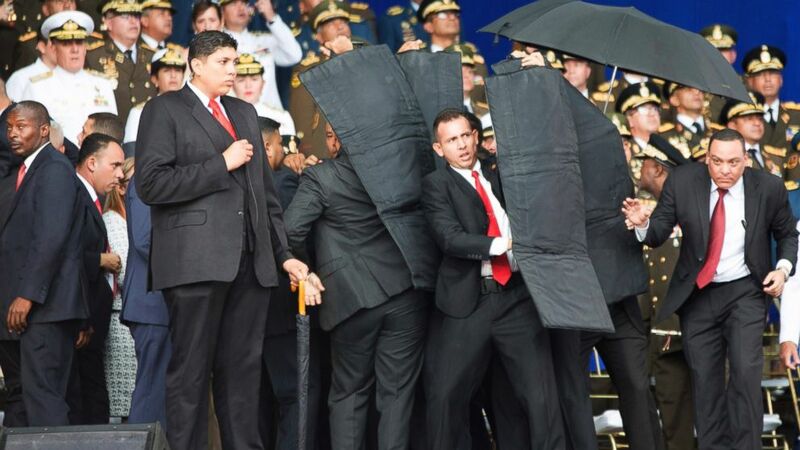 Maduro was speaking at a celebration of the 81st anniversary of the National Guard, when detonations from "various drones" near the presidential area and along the parade route occurred, Jorge Rodriguez, the Venezuelan Minister of Communication and Information, said on Venezuelan state television. The president, who has ruled the country since 2013, called it an assassination attempt in a speech on state TV following the attack. Maduro blamed it on the far-right opposition in his country as well as neighboring Colombia. He said several conspirators were arrested in Venezuela, and appealed to President Donald Trump for help with arresting others connected to the attack in Miami. Bolivian President Evo Morales, an ally of Maduro, took the accusations one step further and blamed the U.S., Pompeo and Vice President Mike Pence -- calling it "Yankee Interventionism" -- in a series of tweets Sunday afternoon. On 07/20/17, then chief of the CIA, Mike Pompeo admitted efforts with Mexico and Colombia to foster a "transition" in Venezuela. Then, on 8/10/17, in the White House, Trump pressed his aides to invade Venezuela. The world is well aware of the plans of the US against Venezuela. On 08/11/2017, Trump warned of a "military option" against Venezuela. That very same day Trump rejected a call from our brother president Nicolás Maduro. On 09/18/17 Trump insisted on his military option against Maduro on talks with 4 Latin American leaders. It's on the record. On 01/23/18, ex CIA head and current Secretary of State Mike Pompeo admitted the CIA gave Trump data on the Venezuelan financial situation and the relationship of our brother president Nicolas Maduro with the army before the US sanctions against Venezuela. Yankee Interventionism. Pompeo did not address the specific accusations on Sunday, nor was it clear he even knew about them. Venezuela has dealt with widespread economic issues, including inflation, poverty, rising crime and hunger, in recent years. The annual percent change in inflation in Venezuela was 13,860 percent as of April, according to the International Monetary Fund (IMF). The IMF ceased assistance in helping the country pull itself out of economic collapse in May, saying, "The Board found that Venezuela has not implemented the remedial measures and has failed to provide information on a number of additional items as required." It said it would take up the issue again in six months. At least 58 people were killed in protests against the government in July 2017. The Overseas Security Advisory Council (OSAC), a part of the U.S. Department of State, reported that Venezuela was the second-most murderous state in the world -- behind only El Salvador -- with 26,616 murders in 2017 (89 per 100,000 people). The State Department lifted its shelter in place order against U.S. residents in the capital of Caracas Sunday evening, but warned them to "remain in immediate area around their housing." ABC News' Sarah Shales and Josh Hoyos contributed to this article.